The Belle Epoque console sink from Renovator's Supply features an elegant vintage design with durable scratch and stain resistant RENO-GLOSS finish. 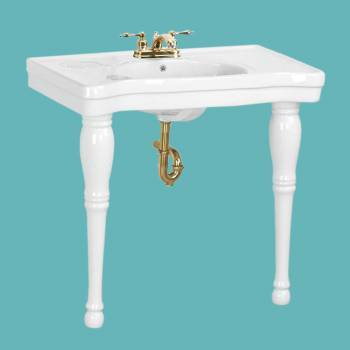 Purchase your Belle Epoque console sink today. 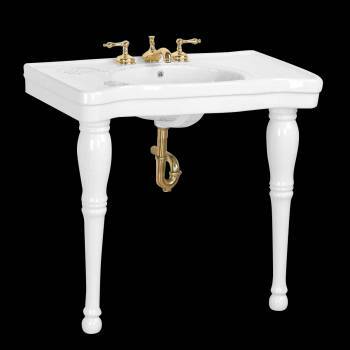 Features: - The Belle Epoque is a beautiful traditional console sink. - Console sinks gives ample shelf space for toiletries. - Constructed from gorgeous Grade A vitreous china ceramic for durability and easy cleanup. - RENO-GLOSS finish protects from scratches and stains. - Authentic Renovator’s Supply logo guarantees better quality than the knockoffs. - Sink Basin with 2 spindle legs - ASME and ADA Compliant Dimensions: - Overall measure is 33-1/4"" High x 33-1/2"" Wide x 19-3/4"" Proj. - Basin measure is 6” Deep x 18” Wide x 12-3/4” Proj. Hardware: - 4” Centerset faucet (not included) - Lag bolts to install NOT included Other Details: - Design Inspirations: Vintage / antique European bathroom stylings What's Included: - One (1) Belle Epoque Porcelain Console Sink - Features Authentic Renovator's Supply Logo.